Starbucks, like that one friend of yours who stages entire photoshoots at lunch, is sooo thirsty for the Instagram likes. Just days after the caffeine empire added new, insanely pink "Dragon Drinks" to its permanent menu, the company unleashed even more crazy-colorful beverages for summer on Thursday. 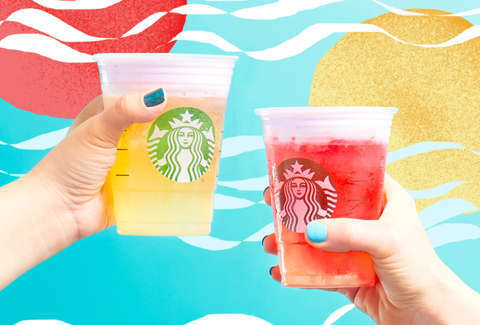 Starbucks calls the new iced drinks Cold Foam Tea Lemonades, and starting on Friday, June 22, you can get them in two flavors: Summer Sunrise and Summer Sunset. Basically, they're Instagram-optimized takes on the chain's existing shaken tea lemonades, complete with fancy foam on top. They're made by mixing a tropical pineapple tea infusion with lemonade. The foam is made with Teavana Passion Tango herbal tea and blended nonfat milk. Summer Sunrise: a cold foam tea lemonade that evokes the bright morning sun with tropical pineapple infusion and lemonade that's sweetened with classic syrup, topped with a velvety cold foam infused with sweet Teavana Passion Tango herbal tea (contains milk). Summer Sunset: a cold foam tea lemonade inspired by dramatic sunsets, this beverage gets its deep pink hue thanks to the addition of Teavana Passion Tango Tea to the pineapple flavors and lemonade. It's also topped with velvety, sweet Passion Tango herbal tea cold foam (contains milk). The colorful concoctions join Starbucks' ever-growing lineup of manically vibrant rainbow drinks that have nothing to do with coffee, including the aforementioned "Dragon" drinks, the Unicorn Frappuccino, the Crystal Ball Frappuccino, the Purple Drink, the Orange Drink, among others. All thanks to the OG Instagram-famous Pink Drink. Tony Merevick is Senior News Editor at Thrillist and still hasn't decided where he stands on foam. Send news tips to news@thrillist.com and follow him on Twitter @tonymerevick.